Are you looking for something new and exciting to do while on vacation? Something, which will not only provide you with adrenaline pumping anticipation but teach you how to work as a team and overcome your fears? If so, whitewater rafting may just be the adventure sport you have been looking for. Besides the rush you will get from paddling through the whirlpools of tempestuous water, rafting down a gentle river in between sections of rapids also gives you the opportunity to soak in the scenery from an entirely different perspective. 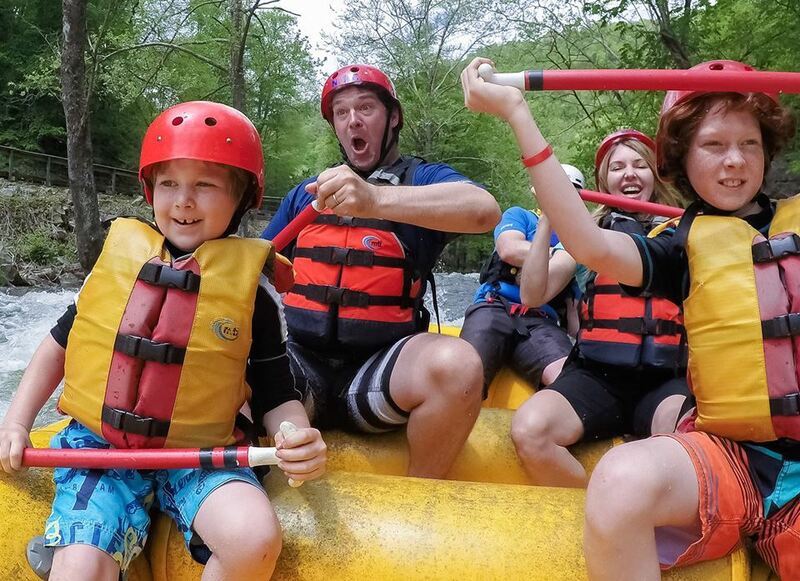 While the rivers of South Carolina might not conjure up thoughts of getting ever closer to the edge of Victoria Falls as you battle the current of the mighty Zambezi, or the white-knuckle ride through the rapids of the Grand Canyon, rivers like the Chattooga will have you coming back time and again for what is sure to be a fun-filled family adventure. Located in upstate South Carolina along the border with Georgia is the 57 miles long Chattooga River, a federally protected area of natural beauty that played a leading role in the 1972 film “Deliverance” starring Burt Reynolds and John Voight. Cutting through steep gorges with breathtaking scenery, the whitewater rapids that range in difficulty from serene family friendly grade II and III to heart-racing class IV and V rapids that Southern Living Magazine claims is the number one adventure in the entire Southeast. The river is divided into sections based on the difficulty of the rapids, section 1 and 2 starts with a gentle, decent dropping 12 feet per mile over a seven-mile stretch that contains small patches of turbulent water. On section 3 of the river, the rapids start to intensify with more than a dozen class III and IV rapids to navigate the raft through. With names like Eye of the Needle and Bull Sluice, the rapids on section 3 are the most popular with families. Section 4 is where the action picks up as the river drops a dramatic 75 feet through a tight gorge that contains the heart pumping, Corkscrew, Crack-In-the-Rock, Jawbone, and Sock-Em Dog rapids all in quick succession. For optimum conditions, the best time to plan your whitewater adventure is early Spring through to late Fall. The amount of rainfall the area receives has a huge impact on how the river performs. The entire 57-mile stretch has no dams to regulate the water flow, making for optimum conditions after a few days of heavy rainfall. All of the outfitters along the river are licensed and insured, and while we do not like to endorse one over the other, the Nantahala Outdoor Center has been in business since 1972. The NOC prides itself on having the most modern equipment and the best-trained whitewater guides in the industry, many of whom have gone on to Olympic fame. For more information and an insight into the NOC please watch the video below. Photos and video courtesy of the Nantahala Outdoor Center.